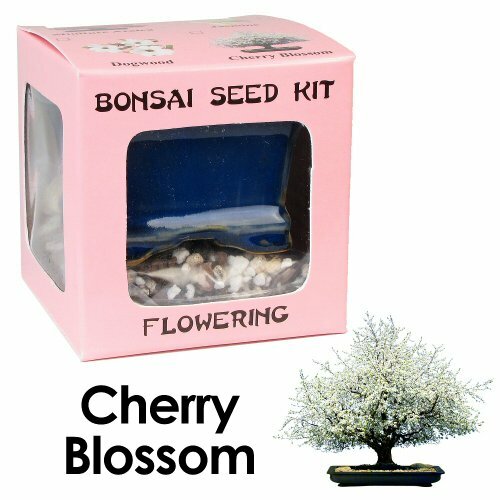 Grow Bonsai Trees from seed with this Complete Cherry Blossom Bonsai Seed Kit. Perfect for children or any individual who wants to get their hands dirty and learn the hobby of Bonsai. The seeds in this kit will germinate and continue to grow for many years. Kit includes Cherry Blossom Bonsai Seeds, Ceramic Container, Bonsai Potting Mix, Pebbles, and Instruction Guide. Cherry Blossom (Prunus mahaleb). Cherry Blossom Bonsai are deciduous trees that bloom in the Spring with beautiful white flowers. The flowers are beautifully arranged in clusters of two or five. The leaves grow alternately and turn yellow, crimson, or red in the Fall. The vast green crown of the tree is held by a single trunk, which gives it a spacious look with long branches. Cherry Blossoms yield a black colored fruit after the blossoming of the flowers in the Spring. With proper care and management, you can achieve a beautiful looking miniature tree that flowers and matures just like regular cherry blossom trees. Size, shape, and color of ceramic container may vary. If you have any questions about this product by Eve's Garden, Inc, contact us by completing and submitting the form below. If you are looking for a specif part number, please include it with your message.